How Low Can We Go! It has been a hard decade plus three to be an Orioles fan, just when you think you can’t sink any lower, they manage to do it. Not only are the Orioles the only team in the league without a homer from a first baseman, but the Arizona Diamondbacks (.271), Milwaukee Brewers (.270) and Cincinnati Reds (.263) also all have higher cumulative slugging percentages from their pitching staffs than the Orioles are getting from first base. With great pain I acknowledge the Yankees are no longer in the basement of the American League East, the Baltimore Orioles have taken their place. It was nice while it lasted. 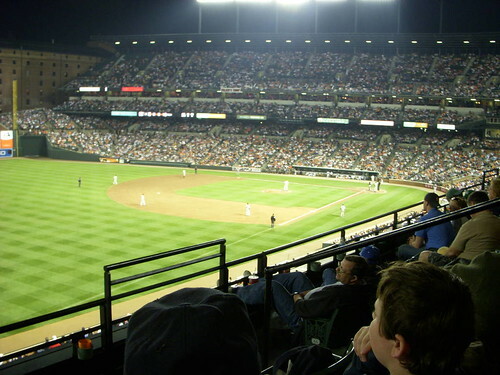 Orioles Park at Camden Yards, originally uploaded by gleefulgecko. We had the worst trip to and from the stadium last night that you can imagine. The bus had raised their prices and were running less buses then got stuck in traffic on the way in, we barely made the game before the opening pitch despite getting to the bus stop more than an hour before the game. It was appalling. On the way home we got to Greenbelt on the BW Parkway and got in a huge traffic jam. They had closed the Parkway. A horrible night for driving. The game on the other hand was wonderful. The Orioles won for the second night in a row vs the Yankees, which feels nice even though I know it is April. Charles was paying attention to the game most of the night, he used to get bored pretty early. The weather was perfect. The only way it could be better was if the game had been in August and mattered for the play offs. The Orioles made some offseason noise this week by trading Miguel Tejada to the Houston Astros then having seventeen players show up in the Mitchell Report on steroids use. They were Brian Roberts, Miguel Tejada, Jay Gibbons, Rafael Palmeiro, Larry Bigbie, David Segui, Jack Cust, Jason Grimsley, Jerry Hairston, Tim Laker, Gregg Zaun, Manny Alexander, Kevin Brown, Howie Clark, Todd Williams, Kent Mercker and Gary Matthews Jr. according to the Sun. Given all this cheating, how is it that we have fielded crap team after crap team. The 1890s Orioles cheated like dogs and they were brilliant. Where did the Orioles lose the ability to take advantage of having a bunch of cheaters on the team? The report is all accusations of course, nobody has been convicted from that list, but it is a really ugly day to be an Orioles fan. Then again, since 1997 when we fired the Manager of the Year who took us to the Championship Series for the AL, there have been many ugly days to be an Orioles fan.